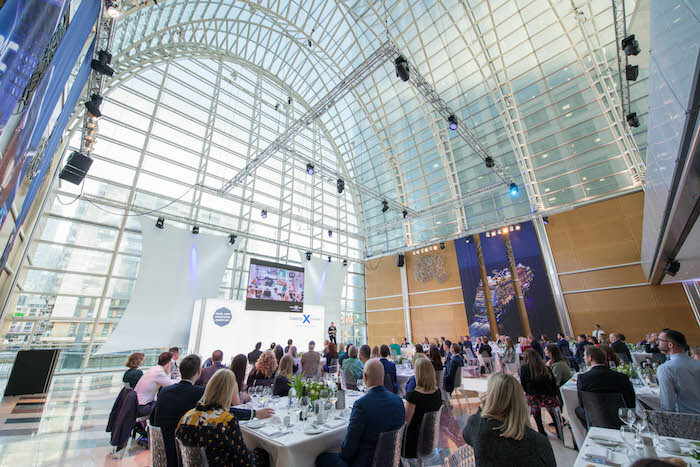 Canary Wharf event venue, East Wintergarden, welcomed Celebrity Cruises and 40 trade partners to celebrate the Travel Agent Appreciation Awards, January 2019. Celebrity Cruises recognised the efforts of the travel trade at its fifth annual Travel Agent Appreciation Awards, whilst marking the successful launch of Celebrity Edge – the first new vessel from the luxury cruise line in six years. The ceremony was attended by 40 trade partners with 13 awards handed out by host Jo Rzymowska, Vice-President and Managing Director for UK, Ireland and Asia along with Gavin Smith, Senior Vice President for parent company Royal Caribbean Cruises. Dellar Davies Productions transformed the Main Hall with a white stage and branded backdrop, with an LED screen suspended from in-house rigging and a white carpet walkway running through the venue. Canvas images of Celebrity Cruises’ luxury vessels were suspended either side of the venue, uplit with free-standing blue and white Chauvet DJ spotlights providing branded hues. Create Food delivered a light lunch menu featuring an Iberico Croquette starter and an Arctic Salmon main for guests sat across 11 tables of 8 in the venues’ Main Hall; Sternberg Clarke supported with live entertainment including three aerial trapeze artistes, rope artistry and a free-standing hoop artist. Six cruise ship images encased in white metal frames created a natural venue break between the drinks reception area and dining space, interspersed with large white LED plant pots complete with indoor ferns. External venue branding was visible on arrival and guests were greeted with a branded registration area in the East Vestibule. The Promenade Room was first used for pre-event media interviews and later turned into a green room for the post-awards entertainment provided by Miami dance troupe ‘The Jewelry Box’. Winners of the Travel Agent Appreciation Awards included Stewart Travel, Thomas Cook, Trailfinders, ROL Cruise, Oasis Travel, Worldchoice Ireland, Hays Travel, Travel Network Group, Travel Counsellors, Kuoni, Cruise 118 and Iglu Cruises.